Background you can feel free to skip: “Dude, we’re not climbing that mountain all the way over there, are we?” my buddy Jered asked as we strolled along the trail to Millbrook Mountain. We’d been hiking for about 90 minutes, and we caught a glimpse of some far-off cliffs looming through the trees. “No way. This hike isn’t that long,” I said, not really sure if I was lying. Turns out, I’m a big fat liar, and this is a really long hike. It’s also a gorgeous hike, and a perfect way to explore some of the most beautiful areas of the Mohonk Preserve, which is one of the most beautiful places in New York, which probably qualifies this as one of the most beautiful hikes in the universe. When my wife and I ventured along this hike many years ago, we hit it on just the right day, and there were blueberries all over the place. Not the regular tiny wild kind, but big, honking, grocery-store-type blueberries on tall bushes. We couldn’t believe that they hadn’t been picked over yet, with all the crowds this place draws. Millbrook Mountain is forever known to us as the Blueberry Hike, though we’ll probably never be that lucky again. If you venture there in blueberry season, I hope you hit a similar jackpot. Also, the endless views that seem to follow you around all day. If you decide to tackle this hike, you’ll need to be prepared for a strenuous stroll – it’s not straight uphill the whole way, but you’ll be meandering along the top of the ridge, generally heading uphill and occasionally climbing up some steep sections. You may have some company out on these trails, especially at the main overlook, but even on days when all of the Preserve’s parking lots are full, the route to Millbrook Mountain never feels too crowded. In any event, you’ll burn a lot of calories on a day spent at Millbrook Mountain. It’s worth every one. 1. You can start this hike either from the West Trapps parking lot or the Wawarsing parking lot (see the “Directions to the trailhead” section below for directions to each) in the Mohonk Preserve. This trail guide assumes you’re starting at the Wawarsing lot, though the Trapps option is way more popular – as evidenced by the fact that it often fills up early on nice weekend days, as it did during my last visit. 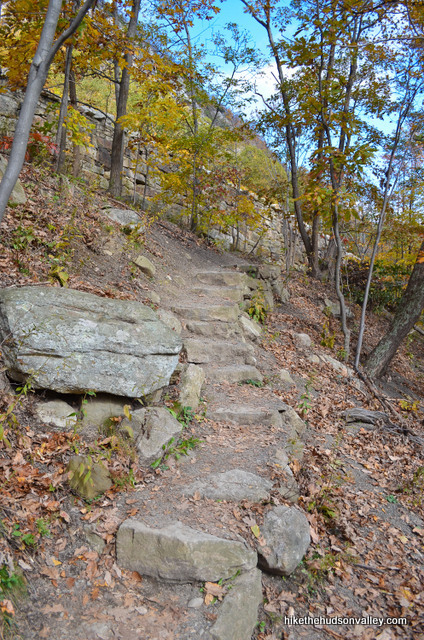 If you’re starting from the Trapps lot, your hike will be about a mile shorter, and you’ll miss out on some of the sights and crazy rock climbers on the Undercliff carriage road. You’ll also skip one giant stone staircase that climbs about 175 feet, so that’s a benefit of starting at the West Trapps lot. If you’re starting from the West Trapps lot, head up the main trail (away from the guard shack) and climb the stone steps up to the Trapps Bridge that crosses Route 44/55 (if you didn’t pay the entrance fee at the guard shack, there will probably be someone at the top of the stairs to relieve you of your cash). Wait on that bridge for a moment – the rest of us from the Wawarsing lot are still catching up to you, cursing you for taking the easy way. Meet us at step #4 below. If you’re starting from the Wawarsing lot, pay your entrance fee at the end of the lot and begin climbing the stairs. 2. Keep climbing! Don’t worry, the stairs can’t go on forever. Can they? It actually only took us about seven minutes to climb all the stairs and reach the intersection with Undercliff Road, where you’ll catch your breath and turn left. Here, you can stroll casually along, enjoying the splendor of the cliffs to your right, the views to your left, and perhaps most beautifully, the lack of more stairs to climb. 3. Meander along Undercliff Road, taking plenty of time to rubberneck at the rock climbers. In fifteen or twenty minutes, you’ll see the Trapps Bridge (for pedestrians and bikers only), on your left, crossing Route 44/55. 4. Head across Trapps Bridge. On the far side, keep straight/right, following signs toward the blue-blazed Millbrook Ridge Trail, which we’ll be following all the way out to the summit of Millbrook Mountain. 5. Just a minute or two after Trapps Bridge, turn left (and steeply uphill) onto the blue-blazed start of the Millbrook Ridge Trail. 6. Ascend rocky terrain as views open up almost immediately behind you. Just keep following those blue blazes over the rocks and through beautiful woods with occasional views as you skirt the top of the ridge. 7. About thirty minutes after joining Millbrook Ridge Trail, you’ll come to your first intersection, with the red-blazed Bayards Path departing to your right. Keep heading straight on the Blue Trail. 8. In less than ten minutes, mo’ views! Careful, that first step is a doozy. 9. If the leaves are down, you might catch a glimpse of Millbrook Mountain through the trees. Don’t worry – it’s not as far away as it looks. Okay, I’m lying, sorry. It’s exactly as far away as it looks. Good thing you’re so tough! About 30 minutes after the intersection with Bayards Path, you’ll come to a second intersection, with the red-blazed Millbrook Cross Path departing to your right. Keep straight on the blue-blazed Millbrook Ridge Trail. 10. The trail passes through more beautiful woods before beginning the ascent of Millbrook Mountain. From the intersection with Millbrook Cross Path, it’s about 1.1 miles to the summit of Millbrook Mountain, gaining 544 feet in elevation. As you ascend, you’ll pass several clifftop spots with awesome views. Behind you, Catskill views reappear. Getting nicer with every step, isn’t it? 11. Towards the top of Millbrook Mountain, the red-blazed Millbrook Mountain Trail joins from the right (coming from Minnewaska). Remember this junction – we’ll be taking the red-blazed Millbrook Mountain Trail back down the mountain soon. For now, keep heading straight/left to climb just a few more feet to the summit. The best view of the day is just ahead. 12. Boom! This is why we do this. Have a seat and enjoy the long views across the Hudson Valley, all the way to the Hudson Highlands, past the Newburgh-Beacon Bridge. To your left, you can see up the ridge to the Skytop Tower at the Mohonk Mountain House. What an awesome spot. 13. Once you’ve soaked in the views and housed a granola bar or two, head back the way you came, to the junction of the red-blazed Millbrook Mountain Trail and the blue-blazed Millbrook Ridge Trail. Turn left to head downhill on the red-blazed Millbrook Mountain Trail. 14. In about five minutes, keep a sharp eye out for the blue-blazed Coxing Trail on your right, which we’ll take all the way until it dead ends into Trapps Road in about 1.75 miles. Turn right onto the Coxing Trail when you see the three blazes that mark its beginning. Or its end, if you want to get all philosophical. 15. Enjoy the awesome scenery as you gently descend on the Coxing Trail. As you keep heading downhill, the trail can get a little damp. Enjoy strolling along the balance beams that help keep your feet dry. In about a mile (it took us about 25 mins at a very casual pace) from the beginning of the Coxing Trail, you’ll see the red-blazed Millbrook Cross Trail joining from the right. Just ignore it and keep following those blue blazes. 16. About twenty minutes and .8 miles after the intersection with the Millbrook Cross Trail, the Coxing Trail ends abruptly, dumping you off onto Trapps Road. Turn right onto Trapps Road and enjoy the relatively flat, leisurely stroll. You’ve earned it. 17. In about one more mile, Trapps Road brings you back to the start of the Millbrook Ridge Trail and then, in a few more yards, to the Trapps Bridge. You’ve visited a lot of nice spots since the last time you were here, right? From here, you can retrace your steps to the West Trapps parking lot or the Wawarsing lot, depending on where your day began. 18. When you get back to your car, happy dance time! It might be worth remembering that nearby New Paltz has plenty of pizza places, and at least one very nice brewery. You’ve earned lots of whatever’s on their menus. Wawarsing parking lot (one-mile longer version of the hike, with more vertical climb, but you get to see some cool sights on Undercliff Road): From New Paltz, head west on Route 299. Follow 299 until it dead ends into Rt. 44/55, where you’ll make a right turn. Follow 44/55 uphill for less than a mile to the well-marked Mohonk Preserve Visitor’s Center and Wawarsing Parking Area. Turn right into the Wawarsing lot, then make an immediate left turn and park as far down the hill as you can. The trailhead is all the way at the end of the lot. West Trapps parking lot (This more popular option is about one mile shorter than if you parked at Wawarsing — and you get to skip a ton of stairs — but you’ll also miss some of the cliff-and-rock-climber goodness on Undercliff Road): Follow the directions above to the Wawarsing parking lot, but continue past the Wawarsing lot on 44/55 for another 1.2 miles, past the crazy hairpin turn, to find the well-marked West Trapps Trailhead parking area on your right. Pull into the lot and park as far back as you can – the trail begins at the far end of the parking lot. You can also get directions by checking out the Millbrook Mountain (Wawarsing trailhead) or the Millbrook Mountain (West Trapps trailhead) entries on the HiketheHudsonValley.com Google map. From there, you’re just a hop and a skip from both parking areas. Hi! Can someone comment on the ‘afraid of heights’ factor? Have done some very challenging hikes but not a fan of narrow ledges – steep drops offs are OK, just not beside narrow ledges. There are some breath taking steep drop offs, but they are “off” the main trail. In other words, you can see open spots where the edge would be, but you would have to actively seek the edge. Those are some of the best spots for a great view, but there was nothing along the main trail where I felt like I was going to fall off the side of the mountain. What an awesome hike! We powered through the uphills and rock faces all the way to the top. The return trip was a cake walk compared to the journey up, but, I suppose that’s the reward for a hard day’s work! A slight adjustment needs to be made…it was $15 per hiker! Luckily our four legged friend didn’t count as a hiker! The whole trip I was trying to justify paying for the hike, and it was worth it! The trails were well marked, maintained, and very clean! The parking lots were full but once out on the trail we saw a few other hikers but it never felt crowed. The only “complaint” was the sheer numbers of rock climbers on the Underclifff road. Thank you, Karl! The Cheapskate Alert is now updated accordingly. Appreciate the heads-up! I am having a hard time getting the coordinates from the new Google maps. Can you see if this can be fixed or you can kindly put the coordinates on the website next to the address? Look forward in hearing back from you. Dewan — Yeah, I’m really frustrated with the Google Maps “upgrade,” which trashed all the links from the map pins to the trail guides, and also erased the very useful left pane that listed all the hikes from A-Z. Sorry I’m not sure about the coordinates either – if you find a fix, I’d love to hear it! I’ll get busy fixing the links within the next week or so, too. Sigh. Dispatch from the future: The GPS coordinates issue is now fixed, and you can find coordinates for the trailhead under the “Directions to the trailhead” section. Still no flying cars, though. Thanks for replying Mike. Love your website! Went with a buddy and hiked the trail this weekend. Indeed it was a load of fun, and long. (Getting a bit lost in the wood made it even a bit longer) but tremendously enjoyable. You were absolutely right about the view. A bit cloudy of a day but the view of Hudson and Cold Springs Harbor was sublime. Hi, new to hiking, love it. This trail has difficulty listed as 9/10, what does that entail? Could anyone share some thoughts on that? Does it entail doing some rock climbing like people do in in-door gym? I count myself as in pretty decent physical shape, but again, new to hiking. Hiked the Giant Steps ( http://www.nynjtc.org/hike/giant-stairslong-path-loop-state-line-lookout) and thought it a whale of fun. Not much difficulty at all. Just wonder how this trail looks compared with Giant Steps. Hi there! No rock climbing here (unless you want to rock climb at Mohonk, but that would be a different excursion). It’s listed as a 9 because it is a long hike with some steep sections – but nothing that would even require the use of your hands to scamper up. This is just a good, old-fashioned tough hike to a beautiful payoff. Several beautiful payoffs, actually. Hope you enjoy it if you give it a try! Truth be told, I was inspired by this listing to hike to Millbrook Mountain today, but I did it entirely as a Minnewaska hike: carriage trail around the lake to Millbrook Mountain Carriage Road to Gertrude’s Nose Trail — which has some *awesome* open views, although I kept wandering off the trail toward the cliff! — and the Millbrook Mountain Trail back to the lake. (This traverses a corner of the Mohonk Preserve for about half a mile; I’m not sure whether I technically owe the preserve whatever their day use rate is, but there were no scary signs to that effect.) It took me just over three hours and yielded many cool views in all directions (topped off by the Catskill views on 44/55 west of the park — although anyone coming from the east will get super Gunk views, so, no worries).